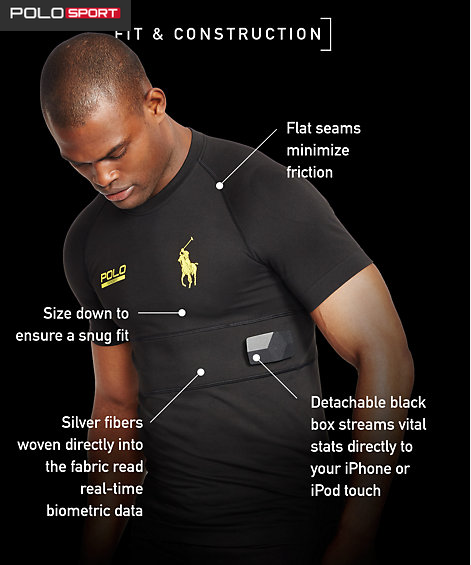 There has been word, for quite some time, that Ralph Lauren would one day be stepping into the wearable technology arena by combining that Ralph Lauren fashion sense with tech innovation. That crossroads appears to have come to pass, as pricing and availability have been announced for PoloTech apparel, with reports suggesting it will go for $295. The PoloTech system was developed along with OmSignal, a tech startup out of Montreal, which supplied the hardware features in a PoloTech shirt. PoloTech shirts are partially comprised of actual silver, with fibers of the metal woven directly into the fabric. Near the rib cage there is a small black box containing several sensors, and it can track various stats from steps taken to heart rate and respiration as well as several others. The shirt only works with iOS as of now, and doesn't work with the other major third-party fitness applications, instead offering up its own app. PoloTech actually got a bit of a road test during last year's U.S. Open tennis match, with ball boys and one of the players—top-ranking star Marcos Giron—wearing the shirt. Giron only wore it during practice, reports note, but anyone who has ever played tennis knows that it's still quite a workout even in practice. Reports suggest that there will be a version coming for women soon, and more casual connected apparel is also poised for a future release. Ralph Lauren executive vice president for advertising, marketing and communications David Lauren, meanwhile, suggested that there might even be a smart suit coming soon, which was enough to stagger at least some imaginations. Those interested in picking one of these up can do so next Thursday at the aforementioned price of $295. Despite the hype, I can’t help but think this might prove to be a tough sale; after all, this is a shirt that costs almost $300, doesn't work with any Android, BlackBerry or Windows devices, and really only does what a fitness tracker might do but only works with its own app. There are so many other devices out there—devices more flexible and less expensive alike—and it might be difficult to find a substantial market here. Worse, there are so many other pieces of smart clothing already—ranging from Athos' micro-EMG line to even some of the stuff made by OmSignal itself—making it even harder to find market footing. But given that it's Ralph Lauren and a clear luxury item, the niche it's likely to take is also likely to be enough to make this a viable product. It's going to be interesting to see how the sales go for the PoloTech line, but it's also very possible that Ralph Lauren will have a new hit on its hands, especially with its current market niche in place.